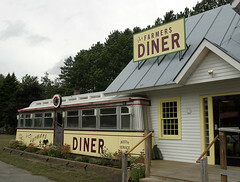 Update: Well, on April 7th, 2012, the Farmers Diner again closed, and it looks like it’s permanent this time. I still think there is a good niche for a place like this, but somehow Farmers Diner wasn’t that place. Carol and I dropped by the new Farmers Diner location to see how things were going. Back in 2003, when Farmers Diner was in their former Barre, VT location, we had a fairly pleasant meal there, but not longer after that, they closed the Barre location. We’ve been looking forward to their return to the local restaurant scene. For those that aren’t aware of Farmers Diner, in addition to just serving food, they have a particular mission, to spend 65 cents of ever dollar on food that originated within 70 miles of the Diner at local farms and small scale producers. So, a substantial fraction of the menu is made from locally produced meat, cheese, and produce (and, with the current menu, they even highlight in red the items that were produced locally). The goal is to create a larger market for local suppliers, and not have to be bringing in our meat and produce from distant locations when we have good products already here. As you can imagine, this isn’t always an easy proposition. It’s not easy to go from the pig to bacon and sausage, so Farmers Diner has an entire sister company (Vermont Smoke and Cure) which produces their bacon. When operating their Barre location, they found that issues such as vegetable prep and economies of scale weren’t working with that restaurant size (hence the much larger location they are in now). But it’s good to see that they are giving it another try. At least right now, there’s some subtle differences between the old Barre location and the current one. Obviously, there is a lot more seating (around 3x as many seats as before), and the location should be conducive to business. They’ve toned down some of the rhetoric (at the Barre location, on the walls and placements were lengthy essays on the value of using local producers), with simply stating “food from here” and “eating is an agricultural act” on the walls. And the menu seems a little pared down, but I’m expecting (and hoping) that will change as they get settled in. On the flip side, they seem to be a lot better about identifying *which* local producers they are using, with the back page of the menu giving a list of suppliers and their locations. As far as food, I had a breakfast sandwich (which, at $4 for a breakfast sandwich and homefries made almost entirely from local vendors seemed to be a good price), and Carol had the Farmer’s Breakfast (shown at right). All in all, a fairly pleasant breakfast. 1. I like the overall concept of supporting local producers, and they do a very good job at this, with a reasonably diverse menu of typical diner items. Some of these were actually quite good; I liked the english muffin (although it was floppy enough that my “breakfast sandwich” needed to be eaten with a knife and fork) as a nice variation from the typical Thomas’ English Muffin we usually get. The home fries were made with very nicely seasoned local red new potatoes, which gave them a pleasant sweetness. And the maple breakfast sausage was nicely flavored and not at all greasy. The lunch menu looks promising as well, but I’ll have to try that another time. 2. It’s good seeing that the Yankee Diner in Quechee Gorge Village has been rehabilitated, although this will be the next in a line of several diners that have inhabited that location (Ross’ Diner and the Farina Family Yankee Diner, most recently). Hopefully they can shake the curse and have some staying power here. 3. Strafford Organic ice cream milkshakes and an ice cream walk up window. Enough said. 1. A minor con is that while I’m impressed that they do a good job with local producers, and my meal was certainly pleasant enough, very little wowed me about my meal; aside from the abovementioned items, I got left with a sense that they need to take it up a notch, and try and really highlight some of the better flavors available from local meats and produce. There are plenty of raspberries and blueberries available right now, but not on this menu. 2. Considering this isn’t their first diner, I was a little shocked by the startup jitters this place has had, both in several delays in opening (from their own staff, I’ve seen “Mid-July” become “August 11th” and then “August 28th”), and some rough edges to the service we had the other day. Then again, it’s been a while since their last location closed, so they probably don’t have much veteran staff. So, I’m glad that there is again a Diner in Quechee Gorge Village, and my initial visit to the Farmers Diner was pleasant enough that I think they might have more luck there than they did in Barre. We stopped on December 10, 2006. Cute place. Ordered two of the specialty sandwiches from the menu and a cheeseburger cooked medium. The cheeseburger was burnt so badly they took it back and replaced it. The second was ok. the shame was that they tried to hide the fact that more than 1/4″ of the burger on one side was solid charcoal black. It could not even be chipped away from the remainder of the burger. The sandwiches were to be served wtih cabot cheddar cheese, according to the menu. None was on either sandwich. Both were served on toast that was so hard it would break your teeth to eat it. The sandwiches did not have enough vegetables and meat to cover two pieces of toast say nothing about three, but it really did not matter as you could not even cut this toast with a fork and knife. Upon pointing this out, the waitress proceeded to tell us that these sandwiches are always like this so she never eats them. The homemade fries could have been good but they were cut as shoestring and such tiny pieces that you could not pick them up to eat them – you needed to use a spoon. There is something about a french fry that says you need a piece large enough to pick it up. We were offered a free desert to make up for our lousy meal…however when it came time to give us that desert, the waitress conveniently forgot about it. We left hungry, with a feeling of being totally ripped off. What negative publicity for the local folks whose products supply this place. Great concept but lousy execution. It is an experience that we placed on our “never to do list” again!! !